In today’s Bible study, I want to teach on the true significance of water baptism in light of Hebraic thought and history, as well as the practice of the early Christian Church. 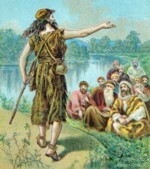 John was called “John the Baptist” – not because he was a member of the Baptist church, nor was he ordained in the Baptist denomination (thank God Christianity wasn’t divided into denominations in those days), but because he practiced water baptism as an outward demonstration of a person’s repentance from sin and committing their lives to God. John was a direct male descendant of Aaron, brother of Moses. He was a Kohen (or Cohen) the distinct priestly line of Kohenim that were only permitted to minister in the Old Testament Temple. Although John was raised in traditional Judaism and his father Zachariah (also a Kohan) served as a priest in the Jerusalem temple, John chose not to follow his priestly heritage. It was God’s will that John not be contaminated by the corrupt religious system of his day. He was a Nazarite from birth and was filled with the Holy Spirit while still in the womb (Luke 1:15). Instead, he obeyed God’s call to be a prophet to the nation of Israel (The prophet Jeremiah was also a Kohenim and expected to serve as a priest after his father, but later became a prophet in obedience to God’s calling). But, John was not just a prophet; he was distinguished with the great honor of being the forerunner of Jesus Christ the Messiah. “I tell you the truth, among those born of women, no one has arisen greater than John the Baptist. Yet the one who is least in the kingdom of heaven is greater than he is” – Matthew 11:11. The early church was first comprised of all Jewish believers in Jesus (Yeshua in Aramaic-Hebrew). The first apostles and their growing number of disciples were but one of many Jewish sects at that time (such as the Pharisees, Sadducees, Essenes, etc.) In fact, the first disciples of Jesus did not call themselves “Christians” (only years later was this term coined), but simply followers of “The Way” – a shortened version of “the true way” or “the right way” in comparison to traditional Judaism and other religions. These early believers in Jesus continued to worship in the Jerusalem temple and observe the laws of Judaism. However, these early followers of The Way differed greatly from other Jewish sects in that they believed that Jesus is the Messiah, that He had died for the remission of our sins (as the Holy Lamb of God), and that His resurrection from the dead ushered in a new age of God’s kingdom rule in fulfillment of Old Testament prophecy. Everywhere, they preached in Jesus’ name and water baptized all new converts into The Way. They grew into a community of believers in Jerusalem devoted to practicing Jesus’ teachings, prayer and fellowship. Water baptism (by full immersion in living water) was not a new concept to Jews. It was actually a common practice in those times. All pious Jews frequently immersed themselves in ritual pools known as “Mikveh’s”* to spiritually purify themselves. So the idea of water purification was not foreign to most Jews when John the Baptist came on the scene. They understood his message of repentance from sin and the corresponding outward act of purification by washing and immersion in a pool of water or river. Jesus is baptized by John to fulfill all righteousness. Many responded to John’s call for repentance and spiritual renewal. They would immediately wade out with John into the Jordan River, and he would baptize them as an outward demonstration of death to the old life of sin and resurrection to a new life of righteousness in Christ. Unlike the frequent Jewish Mikveh washings, John’s baptism was a one-time event for a renewed people of God. John the Baptizer’s prophetic message struck conviction of sin and fear of God’s judgment among his hearers, so much so that even the religious Pharisees and Sadducees came to be baptized by him. On one occasion he thundered at these religious leaders, “You brood of snakes! Who warned you to flee from the wrath to come! Bear fruit that befits repentance, and do not presume to say to yourselves, ‘We have Abraham as our father’…” John dispelled their false sense of security: neither their birthright as Jews nor their religious heritage nor their important leadership positions, would save them from God’s wrath to come if they did not open their hearts in true repentance; they were just as spiritually condemned as non-Jews. Jesus the Messiah was greater than John. John himself admitted he was not the Messiah, but a humble messenger of God. When questioned about whether he was Elijah, or “The Prophet” (spoken of by Moses in Deuteronomy 18:18-19), he told them “I am not.” “I baptize you with water for repentance, but he [Jesus the Messiah] is coming after me is mightier than I, whose sandals I am not worthy to carry; he will baptize you with the Holy Spirit and with fire” (Luke 3:16). At the beginning of Jesus’ ministry, He came to the Jordan River to be baptized by John. One day while John was preaching, he saw a figure approaching him and immediately stopped and cried aloud, “This is he of whom I said, ‘After me comes a man who is mightier that I, for he was before me” (John 1:15) When Jesus asked John to baptize Him, he was astonished and said, “I need to be baptized by You!” But Jesus insisted, “Let it be so now, for thus it is fitting for us to fulfill all righteousness” (Matthew 3:13-14). 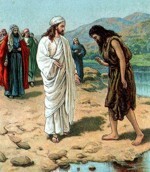 So John obeyed Jesus and baptized Him (even though Jesus should be the one baptizing John). As soon as Jesus emerged from the water, everyone saw the heavens open up and the Holy Spirit descend upon Jesus “like a dove” (not an actual dove, but the Spirit’s gentle presence), and a voice came from heaven, saying, “You are my beloved Son; with You I am well pleased” (Matthew 3:16). Water baptism by full immersion is the correct method. When I was a baby I was baptized by a Roman Catholic priest with the sprinkling of water on my forehead. But after I left the Roman Catholic Church and became a Born-Again Christian, I was baptized again. This second time it was by full immersion in a pool of water – just as Jesus and His disciples did. If you have accepted Jesus the Messiah as your Savior and Lord and have never been water baptized (by full immersion), it’s time that you did so. You can be water baptized in a church baptismal, a swimming pool, a river, or even a spa – as long as you do it prayerfully with a repented heart towards God. Make sure you are able to go completely under the water; that’s how true believers have done it from the very beginning of the Christian church. If water baptism was important to Jesus, it should be important to us. Don’t keep putting it off. I know God will bless you in a special way for honoring His Word. 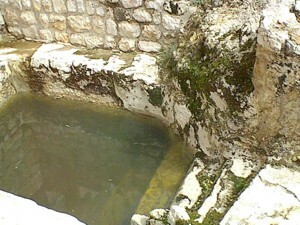 * The Jewish rite of water purifification in a Mikvah (pool) was known as Tevilah. Tevilah was by full body immersion with “living” water from a Spring. The Mikvah had the proportions 3 cubits long & 1 cubits deep and 1 cubit wide. This was done for purifications before certain events such as spiritual cleansing, coming into the presence of God, marriage, and also after certain events such as childbirth and disease. Tevilah was also one of three requirements for conversion of the Gentiles to Judaism. The washing of hands & feet commonly practiced was a miniature Tevilah. Categories: ASK RABBI JESUS, QUESTIONS & ANSWERS, Why Water Baptism Is Important | Tags: 16, Apostles, Baptism, Baptizer, Christianity, Early Church, Elijah, Essenes, God, Holy Spirit, Isaiah 40:3, Israel, Jeremiah, Jesus Christ, Jewish Mikvah, John the Baptist, Jordan River, Judaism, Kohen, Kohenim, Luke 3:16, Matthew 11:11, Matthew 28:18-19, Matthew 3:13-14, Messiah, Pharisees, Sadducees, Sprinkling By Priest, Tevillah, The Prophet, The Way, Water Baptism, Water Immersion, Yeshua | Permalink. I personally dont think that you must be water babtised to be saved, according to the scripture you have to repent and believe, and being babtized is a symbol of being whole in Christ, then fast. If Jesus water baptism means nothing than why did he instituted it? and for what propose is Jesus water baptism for? In John’s account in chapter 3 we have Jesus baptizing whereas not long afterward John explicitly mentions that Jesus did not baptize. Why is this? The idea here is that the apostles were baptizing on his behalf. Because they were baptizing in his name, it was, in essence, Jesus baptizing. This is the wording of Jesus Christ Himself. Also in Joh 3:5 Jesus answered, Verily, verily, I say unto thee, Except a man be born of water and of the Spirit, he cannot enter into the kingdom of God. The bible is clear on this matter, DO NOT BE DECEIVED!!! 12But as many as received him, to them gave he power to become the sons of God,> even to them him, he <get water baptized ? Only them that have a chance to be water baptized. The apostles understood jesus when he said.